This is how the birth of Jesus Christ came about. When his mother Mary was betrothed to Joseph, but before they lived together, she was found with child through the Holy Spirit. Joseph her husband, since he was a righteous man, yet unwilling to expose her to shame, decided to divorce her quietly. Such was his intention when, behold, the angel of the Lord appeared to him in a dream and said, “Joseph, son of David, do not be afraid to take Mary your wife into your home. For it is through the Holy Spirit that this child has been conceived in her. She will bear a son and you are to name him Jesus, because he will save his people from their sins.” All this took place to fulfill what the Lord had said through the prophet: Behold, the virgin shall conceive and bear a son, and they shall name him Emmanuel, which means “God is with us.” When Joseph awoke, he did as the angel of the Lord had commanded him and took his wife into his home. Let’s look at what was placed on Joseph’s plate. Joseph must have had huge doubts about Mary when she was found to be pregnant. Joseph and Mary had not lived together (consummated the marriage), so Joseph had every right to believe Mary had been unfaithful to him, until an Angel of the lord appeared to him in a dream. The angel spoke to Joseph, assuring him that Mary had not been unfaithful, rather she was carrying the Son of God. What a trusting man Joseph must have been! How would you react? Wouldn’t that seem a little too far-fetched to be believable? Wouldn’t you just think that a dream is a dream and nothing more? Joseph didn’t: he had faith that what he had been told by the Angel was fact. I would like to think that if placed in the same situation, I would be able to react with faith as Joseph did. But most likely I would still be skeptical of the validity of the whole situation. What do we know about Joseph? Not much actually, other than he was betrothed to Mary, which means that his marriage to Mary had been arranged by his and her parents; it is believed my many theologians that he was young, probably 16 or 17. We know that he was a devout man, a carpenter by trade, and he was from Bethlehem, but lived in Nazareth. Not a lot of detail about the man who would raise Jesus to adulthood. We know that he was “pledged to be married” to Mary. What newer versions of the Bible call “pledged to be married,” the older versions call “betrothed.” This refers to an ancient Jewish marriage custom. In those days, most marriages were arranged by the parents–with or without the children’s approval. The two sets of parents would meet and draw up a formal marriage contract. When the contract was signed, the man and woman were legally “pledged” to each other other. This period of betrothal would last up to a year, at the end of which period they were formally married in a public wedding ceremony. Now that sounds like our practice of engagement, but there were some major differences. In the first place, the “pledge” was considered as sacred as marriage itself. During that year, the couple were called husband and wife but they did not live together. If the man died during that year, the woman would be considered a widow even though the wedding ceremony had never taken place. The only way to break the betrothal was through a legal divorce. In essence, to be “pledged” to each other was the same thing as being married, except that you could not live together until the wedding ceremony took place. The whole idea was that the one-year waiting period was meant to be a time for testing commitment and faithfulness. Now Mary turns up pregnant. Joseph only knows one thing for sure. He’s not the father. What words describe a man at a time like this? Anger … Confusion … Frustration … Embarrassment … Shame … Rage … Disappointment. What did he say to her? What did she say to him? Did she tell him about the angel Gabriel? If she did, can you blame him for not believing her? Did he say to her, “Mary, how could you? You were pledged to me. We were going to get married. I think Joseph cried harder that day than he had ever cried in his life. I shudder to think that if this situation happened today it might end in an abortion. Thankfully, Joseph and Mary didn’t have that option. Abortion was very rare in ancient Israel and Planned Parenthood hadn’t opened up a clinic in Nazareth yet. Joseph’s dilemma was of a different variety. He was an observant Jew and under the Law he had the right to divorce Mary for unfaithfulness. In fact, the Law forbade him to marry her under those circumstances. Here is the greatness of Joseph. Because Joseph her husband was a righteous man (that means he wanted to do what was right in the eyes of God) and did not want to expose her to public disgrace (that means that he although he thought she had been unfaithful, he still didn’t want to humiliate her) , he had in mind to divorce her quietly. In those days, a man could get a divorce in two ways: First, he could get a public divorce by going before a judge at the gate of the city. That would mean that the whole town would know about Mary’s shame. Second, he could get a private divorce by giving her the papers in the presence of two witnesses. It is entirely to Joseph’s credit that he chose to do it privately and thus spare Mary the humiliation of a public divorce. Having made his decision … he didn’t do it. He had every legal and moral right to divorce Mary but he just couldn’t do it. He hesitated, waited, thought long and hard. Day after day he pondered the matter. Time was running out. With each passing day, it became more obvious that Mary was pregnant. He had a dream and in the dream God spoke to him. An angel of the Lord appeared to him in a dream and said, “Joseph, son of David, do not be afraid to take Mary home as your wife, because what is conceived in her is from the Holy Spirit.” To us, this seems strange. But not to Joseph. God often spoke to people through dreams in the Bible. It was one way he used in those ancient days of communicating to his people. He couldn’t marry Mary until he was sure it was all right. He had to know the truth. God met him at the point of his need at exactly the right moment. He told Joseph the one thing he most wanted to hear: “Joseph, son of David, do not be afraid to take Mary as your wife.” The angel explains just enough and nothing more. The baby is “from the Holy Spirit” and thus not of man. Nothing more is said. We are not told precisely how the virginal conception of Jesus in the womb of Mary took place. It remains one of the great mysteries of the Christian faith. After 2000 years of debate, we know nothing more about it than Joseph did.The angel added a detail about who this baby will be. His name is Jesus, which means “Savior.” His mission is to save his people from their sins. We give more attention to Mary and rightly so. But Joseph deserves his credit, too. He is a model of the man of faith, struggling with his doubts, persuaded to believe what God has said and ultimately acting upon his persuasion. He was tough when he could have been weak. He was tender when he could have been harsh. He was thoughtful when he could have been hasty. He was trusting when he could have doubted. He was temperate when he could have indulged himself. Joseph had much on his plate. And he accepted it and met it with faith. What about you? 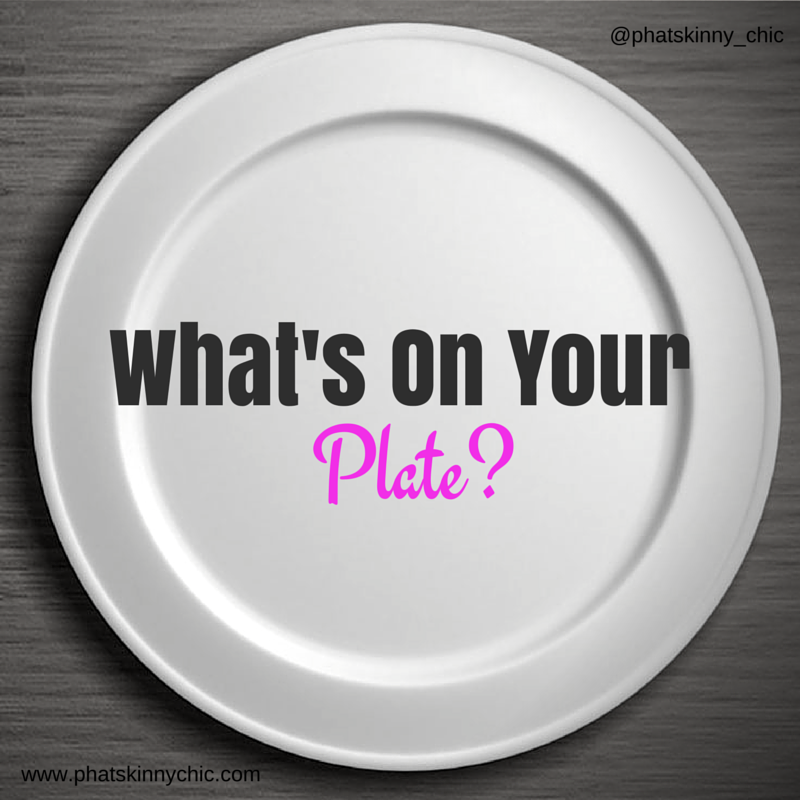 What’s on your plate? How do you handle what life throws at you? Loving God, Help us to be more like Joseph, trusting, tender, thoughtful and temperate. Give us the strength to accept the situations before us and make the appropriate decisions for each situation. Amen.